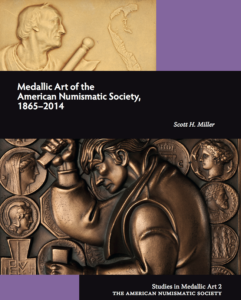 During the past 150 years, the American Numismatic Society has been a leader in the publication of art medals in the United States. Generally employing the finest medalists available, the Society has set an example few can match. In addition, with the exception of the United States Mint, no U.S. entity can boast so long and distinguished a contribution in this area. Founded in 1858, the American Numismatic and Archaeological Society, as it was known from 1864–1907, believed the issuance of medals to be a part of its mission from the earliest years of its existence. Author Scott H. Miller includes 60 medals issued by the ANS between 1865 and 2014 along with two COAC medals and the 1910 Actors’ Fund Medal, all accompanied by color photographs. Many entries are supplemented by artist’s sketches and archival photographs as well as the stories behind each issue. Four appendixes include recipients of some of these medals as well as the list of dies, hubs, galvanos, and casts of ANS medals in the ANS’s own collection. Read the 2015 E-Sylum review by David Alexander.